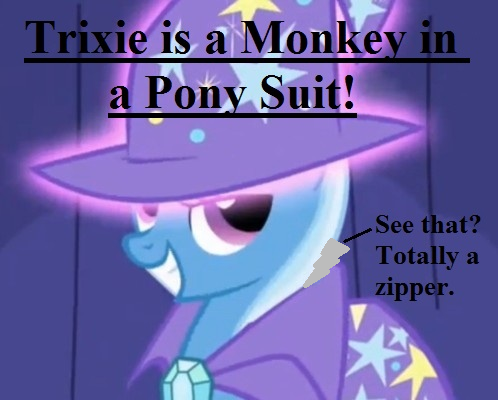 In a truly shocking discovery, Unreliable Sources have confirmed that the pony known as the Great and Powerful Trixie is in actual fact not a pony but a monkey of marginal intelligence wearing a very accurate pony suit. This comes as a shock to all of Equestria as Trixie had always made very vocal, and insistent, claims that she was a unicorn of unquestionable magical aptitude and not a primate lacking greater intellectual faculties. The discovery was made at Trixie’s most recent Canterlot performance where the unicorn was to make the royal labyrinth disappear, attempting to prove she was as powerful as Discord. She had not been anticipating, however, that Ponyville resident Scootaloo, a member of the Cutie Mark Crusaders, would be making the same attempt. No word has come to us as to why Scootaloo was trying to make the labyrinth disappear, but our Unreliable Sources think it has something to do with the several hundred pounds of explosives they discovered and Scootaloo thinking to earn the cutie mark of a demolitions expert. The resulting, poorly-timed explosion tore through the first few layers of Trixie’s pony suit, revealing the weak-minded monkey hiding within. Shrieking at the audience and throwing the ruined suit at Scootaloo in anger, the monkey earned riotous laughter from the shocked audience. “She’s the Great and Powerful Monkey!” Pinkie Pie, a member of the audience, proclaimed while rolling across the half-destroyed stage in laughter. Moments after interviewing Twilight, the smart-as-a-stone monkey leapt to the stage and proclaimed in oddly lucid words that we were all, “In the presence of the greatest magician Equestria has ever known!” The monkey then tore off what was actually a monkey suit, revealing herself to be the Great and Powerful Trixie in a monkey suit. The trick was so flawlessly enacted that no pony suspected it was a trick. To uproarious applause, Trixie was proclaimed great and powerful once more and Scootaloo and Trixie took a bow. Well played Trixie. Well played. In a development that has shocked absolutely no pony, the parasprites, little flying critters of multiple colors who multiply at an unsustainable rate, have destroyed another parasprite rights activist group. This is the third time such an event has occurred. “We all want rights for parapsrites. They deserve to live here as much as sweet Celestia they’re everywhere!” quoted Peta Pie, former chairman of this third parasprite rights group. Events unfolded exactly as predicted by anyone not involved in the activist group and it does not need explaining what happened to their immaculate activist group headquarters. “Get them off me! Get them off me!” quoted an unnamed parasprite activist as she was carried off by parasprites. The same ponies that had lobbied the Celestia administration to provide Equestrian land for parapsrites to settle on were seen carrying blow torches shouting, “Burn devil creatures burn!” before being flown off screaming in terror by happily humming parasprites. The parasprites were escorted out of Equestria in the usual manner, Pinkie Pie of Ponyville coming in to lead the creatures away as she’d done after the previous two activist groups’ follies. Princess Celestia herself has made it illegal to form such organizations anymore, a violation of free speech that no pony seems to openly object to, and has issued bagpipes to local municipal police ponies. Canterlot has seen its first full week of protests outside Princess Celestia’s castle walls as more and more ponies and “bronies” (border-renegade ponies) assemble to protest what they call the democracy-limiting policies of the princess’s administration. What started as a group of ponies coming forth to petition the princess grew to an occupation protest as the young ponies were blocked entrance to the castle and forced to wait on the street outside the castle wall. The protesting ponies are criticizing the limitations on free speech, lack of voice in government, and the general feeling that Princess Celestia has become too powerful. They also seem to want more muffins, but this demand has not been confirmed. It has been difficult to ascertain the exact demands of the protestors, but they all seem to agree that Celestia needs to redistribute some of her authority. “Only 1% of Equestrian ponies are alicorns,” one anonymous protestor quoted, “99% of the population is Earth ponies, Pegapodes and unicorns. We are the 99%!” While these numbers are disputed, it seems that a more representative form of government is what these protestors are demanding. Initial reaction to the protests was viewed as overly hostile. Guard ponies dropped pepper shakers on the protestors from the castle walls, making the protestors sneeze uncomfortably for several minutes. However, some have offered support. Griffons and zebras from overseas have flown in deliveries of food to keep the protestors sustained, often calling the local Pizza Hay franchise to deliver pizzas. As reported in issue #7, Princess Luna has been at the forefront of this democratic movement. She has, in actual fact, shown little direct support for the movement but her silent approval of the protestors’ demands has turned her into a symbol for a representative republic. There has been no word as to if Luna will speak, though the protestors continue to chant her name. Princess Celestia has called the protestors a “mob” and refuses to relent to their demands. But protestors don’t seem ready to leave and it may come to violence before the “Occupy Castle Wall Street” movement ends. What is real? How do you define real? If you're talking about what you can feel, what you can smell, what you can taste and see - then real is simply electrical symbols interpreted by your brain. This is the world that you know: Equestria as you've known while you read this. It exists now only as a neural, interactive simulation... That can be called the Manetrix. "These things are designed for other species. These things are designed for users with fingers - they're designed with bipedal creatures in mind. Ponies are neither and yet, while we're the dominating species in Equestria, we seem to not be able to use them! They're made for HYU-MANS!" As if on cue, however, Lyra's fiancé (a creamy-white pony with a midnight-blue and pink mane complete with candy wrappers for a cutie mark) swiftly bolted in and pulled her away from public. Before I could get any word in, the pony hauling her away nervously smiled at me and any bystander watching in amusement while struggling to keep Lyra from attacking anyone. While much of her arguments can eerily be true until proven false, Lyra takes another step by actually labeling such creatures as 'Hyu-Mans.' To make things even more strange, Lyra has a collection of drawings she's made in her home of said 'Hyu-Mans.' They appear to be bipedal creatures similar to monkeys but with hair only on the top of their heads. So is it simply a mare diagnosed with a paranoia, or does Lyra actually see something the rest of us don't? Note from Joe Stevens: this article does not have the approval of the EI Staff. It is inflammatory and wrong, like most of the other stuff we publish. Humans exist. The EI’s human staff got here from a dimensional portal we found in Ed’s garage. Believe. I’LL BLOW IT UP FOR CHEAP! Hey there Ponyville. I’m Scootaloo and I’m the best blow-up-er there is! I’ll blow up your house, your trees, even your neighbor’s lawn gnomes for less gems than anyone in town! That’s right. Once I figure out which wires go into this trigger I’m sure I’ll be able to figure it out. Just forget about that one time I blew up the Cutie Mark Crusaders club house. That was totally not my fault. I told Applebloom not to kick the C4! Now that I actually know C4 is much more reactive than I thought, I’ll be able to blow up anything. Pretty sure. 80% sure. Okay 75% but if I blow up the wrong thing again I’ll give you a half off discount. That sounds fair, right? So call me today! AND KEEP THOSE FREELANCE ARTICLES COMING! 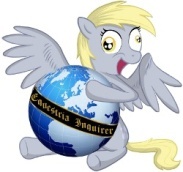 To submit freelance stories or feedback to the Equestria Inquirer, email Joe Stevens at [email protected]. Join us next week for Issue #9 and be sure to follow us on Twitter at http://twitter.com/#!/JoeStevensInc. Issue #10 will be all-freelance and will have a special announcement!